PennDOT now says it will only need six months of road closures to replace the Rt. 926 bridge over the Brandywine Creek. POCOPSON — Although it meant a year of delay while operational plans were revised, the new timeline to rebuild the bridge over the Brandywine Creek on Rt. 926 will need only six months of road closure, when the project starts late next February. 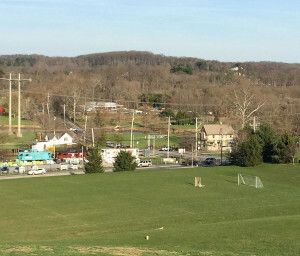 That’s according to the Pennsylvania Department of Transportation and the company managing the project for PennDOT, Gannett Fleming, as plans and details of the project were reviewed during a special public session, Wednesday night at Pocopson Elementary School. Frank Eells of Gannett Fleming took questions for more than an hour from some 200 people gathered in the school’s gym — ranging from questions about detoured traffic to penalties for late completion. Most of the details of the bridge replacement have not changed since May, 2014, when the original construction plan was revealed in a similar forum — except the timeline. Initially, PennDOT projected an 18-month closure of the bridge, along with closures of Creek Road, north of Rt. 926 for an extended period. Construction had been slated to start in 2015, but the project, in the works for two decades, was again delayed. The bridge has been slated for replaced due to both structural deficiencies — which have led to weight restrictions in recent years — as well as the fact that the bridge and roadway floods multiple times a year, resulting in road closings. The project is designed to solve both issues. Late last year, PennDOT announced it expected a shorter build time — less than a year — with a start some time after March, 2016. Now, PennDOT officials say, the bridge will close in late February, 2017 and be open to traffic by Labor Day, 2017 — with large penalties built into the contract for the builders if the project runs even a day late. The closure of Creek Road will be much shorter than planned as well, from June, 2017 through Labor Day, 2017. The entire project will take more than six months, but much of the work will be completed after the roadway is reopened, officials said. The bridge will need to be closed for a weekend in March, 2018 for epoxy coating of the concrete deck, he said. The entire scope of the $9 million project, expected to go out to bid later this year. Eells said much of the speed up comes from changing the work schedule from five days a week, with eight-hour days to six days a week with 10-hour days. With just six months for demolition and construction, the winning contractor for the $9 million project — to be selected via the bid process — will have to run a very tight schedule. Only flooding days will be acceptable add-ons to the schedule without penalty, Eells said. Eells also said that local residents do not need to worry that the same sort of utility issues that delayed construction of the Rt. 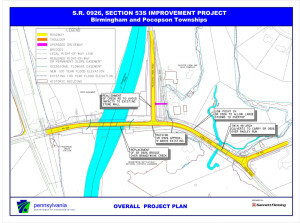 52 roundabout will come into play on this project. He said there are only two utility poles in question and they are slated to be moved well before construction is expected to start. There is some urgency to get the project done, now, Eells said. The bridge rates an “8” out of 100 in terms of condition, he said, according to PennDOT’s assessments. A new traffic light will be built at Rt. 52 and Pocopson Road prior to construction work starting on the bridge to help cope with the likely additional traffic on the roadway. But no other changes are expected relative to the narrow bridge. Eells noted that little could be done either for the bridge, which is nearly a century old, or the intersection of Rt. 52 and Creek Road, which bogs down under current traffic conditions and frequently sees the stone walls of the bridge taken out by trucks attempting to turn onto the bridge. The Lenape Bridge — which has been resurfaced — still remains a worry to local residents, especially when it comes to truck traffic on the narrow bridge. A number of residents questioned why large trucks — prohibited over 28 1/2 feet on the Lenape Bridge and restricted by weight to 26 tons (33 for combinations) on the Rt. 926 bridge — continue to use both without enforcement penalties. Eells confirmed that the currently closed bridge on Birmingham Road will be repaired in the coming months and the roadway will be reopened before the Rt. 926 bridge project begins — offering another route for local motorists to go from Birmingham across the Brandywine to Pocopson and Unionville. Still, the official detour will call for motorists to use US-1 and Rt. 52 — which Eells acknowledged probably won’t be the first choice for local drivers, but is intended to get commercial traffic off local surface streets. In terms of the scope of the project, little has changed since the plans were announced in May of 2014, beyond some cosmetic improvements to the bridge itself, including the use of field stone and brown paint to make the structure blend into its surroundings better. The plan calls for a longer bridge, a raised roadway from the railroad tracks to the eastern intersection of Rt. 926 and Creek Road, the movement of Creek Road a bit closer to the Brandywine to preserve a historic stone wall and structure at the western intersection and a pair of raised arch culverts over Radley Run. PennDOT has set up a Website for updates on the project, PA926.com as well as a Twitter account #PA926.